We offer same and next day delivery, well-stocked inventory and a diverse product line. We provide the solid foundation to help you build a brilliant backyard. 450 E. Pinnacle Peak Rd. 7243 N. El Mirage Rd. 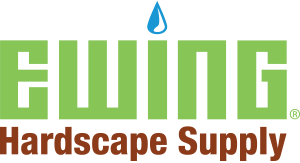 As a trusted irrigation, landscape and outdoor living product supplier for nearly 100 years, Ewing Irrigation & Landscape Supply continues to build its product offerings for our customers. We’ve now opened our first Ewing Hardscape Supply locations in Arizona and Colorado. This new arm of our business offers contractors and homeowners greater access to bulk hardscape materials. In addition to offering great products, we’re known for our exceptional customer service to contractors and homeowners alike. Ewing Hardscape Supply will also provide the same great service you’re used to as a Ewing customer. Ewing Hardscape Supply is an affiliate of Ewing Irrigation Products, Inc. Learn more about the company at EwingIrrgation.com.